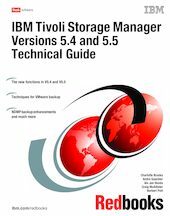 This IBM® Redbooks® publication provides details of changes, updates, and new functions in IBM Tivoli® Storage Manager Version 5.4, and Version 5.5. We cover all the new functions of Tivoli Storage Manager that have become available since the publication of IBM Tivoli Storage Manager Version 5.3 Technical Guide, SG24-6638. This book is for customers, consultants, IBM Business Partners, and IBM and Tivoli staff who are familiar with earlier releases of Tivoli Storage Manager and who want to understand what is new in Version 5.4 and Version 5.5. Hence, since we target an experienced audience, we use certain shortcuts to commands and concepts of Tivoli Storage Manager. If you want to learn more about Tivoli Storage Manager functionality, see IBM Tivoli Storage Management Concepts, SG24-4877, and IBM Tivoli Storage Manager Implementation Guide, SG24-5416. This publication should be used in conjunction with the manuals and readme files provided with the products and is not intended to replace any information contained therein.